It's cosy jumper season! Woopie! I really love this time of year - I feel like my outfits are a bit more stylish, well put together and I absolutely love layering up. Knitwear is a great way of keeping warm as well as looking stylish and I love a classic cable knit just as much as an embellished number. 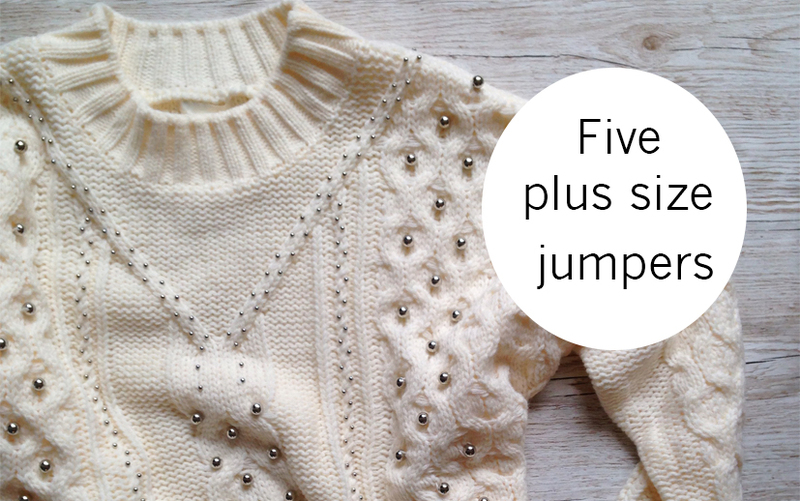 I've put together a selection of my five fave jumpers - let me know which one is your favourite in the comments below. 1. Clements Ribeiro for Evans - I love the fun camo print on this jumper! boyfriend jeans or for a night out with skinny pants and heels. 3. Cable Knit from Navabi - A classic style that everyone should own. 4. Monochrome Striped Jumper from Forever21+ - Monochrome never goes out of fashion. 5. Breton Stripe Jumper with elbow patches from ASOS Curve - I am addicted to breton stripes t-shirts and I am so happy there is finally a plus size jumper version. P.s For reference the jumper in the header picture is from H&M main range and it is a size 'L'. It would comfortably fit up to a UK22. I would wear every single one of those. Dammit. I want jumpers now. Jumpers, turtle necks, and pleather - my winter wardrobe sorted!